Each year on the third Monday in April the state holiday of Patriot’s Day is celebrated in Massachusetts. And every year since 1897, the Boston Marathon is held on that day. The joy of that day was shattered on April 15, 2013 by two powerful explosions that killed three and wounded more than 250 others. 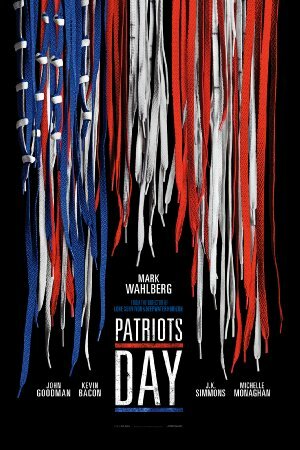 Now comes the first feature film to tell the story of the people whose lives were changed on that day, Patriots Day from writer/director Peter Berg. Starring Boston native Mark Wahlberg as Boston PD “Sergeant Tommy Saunders” (a composite of several real police officers involved in the aftermath of the bombing and the investigation into who was responsible) the film tells it story with time/location stamps to provide its audience with an accurate timeline of the events from the night before the bombing through the arrest of Dzhokhar Tsarnaev (portrayed by Alex Wolff). Most of the actors in the film are playing real-life characters. Kevin Bason as FBI Special Agent in Charge Richard Deslauriers, John Goodman as Boston Police Commissioner Ed Davis, Michael Beach (best known for the TV series “Third Watch”) as Governor Deval Patrick, Themo Melikidze as Tamerlan Tsarnaev and Melissa Benoits as Katherine Russell (Tamerlan’s wife). Christopher O’Shea and Rachel Brosnahan portray real-life husband and wife Patrick Downes and Jessica Kensky. The movie moves slowly up to the moment when the bombs explode and then for a moment time seems to stop. Then the pace becomes furious to aid the victims and find the terrorists behind the attack. In telling the tale the filmmakers go to great lengths to show the difficult choices faced by law enforcement and government officials. Would labeling the attack as terrorism immediately result in a major backlash if that assessment proved to be wrong? Should they release photos of the suspected bombers and give them the chance to flee? These choices and the events that led to finding the Tsarnaev brothers are laid out in an engaging and informative manner. The movie’s impressive cast also included J. K. Simmons as Watertown PD Sergeant Jeffrey Pugliese, Vincent Curatola as Boston’s Mayor Thomas Menino and Jimmy O. Yang as Dung Men. It was the carjacking of Men by the Tsarnaevs and his subsequent escape from their clutches that provided a major break in the case. The conclusion of the manhunt, Tamerlan Tsarnaev’s death, the shoot-outs and the capture of Dzhokhar are well done action sequences and have a very realistic feel to them. The presence of the composite character played by Mark Wahlberg at every important of the film goes beyond coincidence and becomes an obvious concoction. Dramatic license is one thing but this goes a bit too far. The three people killed by the bomb’s initial blast were Krystle Marie Campbell, Lu Lingzi and eight year-old Martin William Richard. MIT police officer Sean Collier was shot and killed in his police car by the Tsarnaev brothers. Boston PD officer Dennis Simmonds died of injuries he suffered during the firefight between the police and the two terrorists. 14 of the blast victims had to undergo amputations. Jessica Kensky and Patrick Downes both underwent below the knee amputations on their left legs. Roughly two years Ms Kensky chose to have her right leg amputated because of the excruciating pain from her injuries. It should be noted that the One Fund Boston, established to aid the victims of the bombing and their families raised and distributed more than $80 million for those victims. Patriots Day is definitely Boston Strong. Plot: An account of Boston Police Commissioner Ed Davis's actions in the events leading up to the 2013 Boston Marathon bombing and the aftermath, which includes the city-wide manhunt to find the terrorists behind it.